Wondering How to Make Earth Day Every Day? Natalie Pace, Co-creator of The Earth Gratitude project & author of the Amazon bestsellers, The Gratitude Game, The ABCs of Money & Put Your Money Where Your Heart Is. 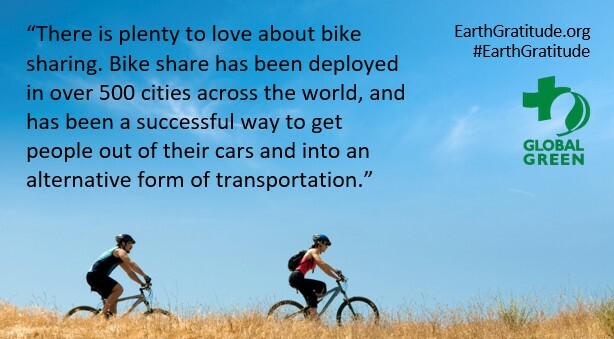 Learn more about successful bike sharing programs at GlobalGreen.org and EarthGratitude.org. 6. Dine by Candle Light. 7. Dance Under the Stars. 8. Power up the Gratitude. Power Down the Grid. 9. Get Inspired with the Wisdom of the Sustainability Visionaries. 10. Commit to 14-Days of Gratitude & Sustainability. And here’s more info on each celebration. Green schools can save hundreds of thousands of dollars each year in operating costs. Green businesses can save hundreds of millions, and green homes can save thousands. The average person spends almost $8000/year on their car (including payments, fuel and insurance). Communities like Santa Monica, California (and many others) are making it safe, convenient and cost-saving to ride bikes and take the rail system everywhere. Is this right for your community, too? Learn how to save thousands each year with smarter energy choices. Many organizations, including the Earth Day Network, Global Green, H.R.H. The Prince of Wales, Leon Krier and Secretary Steven Chu, have come together in the Earth Gratitude project to make it easy to change your home and community. Download the Earth Gratitude mini ebooks at http://earthgratitude.org/. Many species are suffering due to climate change. Others are on the verge of extinction due to poaching and a black market for illegal wildlife products. Awareness and wisdom are the first steps toward meaningful action. Whether you host a beehive or create a sustainable fashion brand built on wildlife awareness, you can be the change a species needs, once you know where and how to focus your efforts. WildlifeDirect and the Nafferton Ecological Farm at Newcastle University both offer wisdom in the free Earth Gratitude ebooks. Ten years ago, riding a bike in Santa Monica, California was a risk to your life. The bike lanes were shared with car parking, on crowded streets where angry, grid-locked drivers swerved and sped. Today, Santa Monica has a robust bike-share program, a rail system and car-share to fill in the gaps. All of this starts with getting on a bike and asking your friends to join you, just as Johan Esbensen, the CEO of DTA Posse, did — before today’s bike-friendly Santa Monica. Yo Esbensen made it cool to bike in Santa Monica and Venice, California — before bike-share! It’s also a fun way to get to the beach or the park. Kids in Japan celebrating Earth Day. His Holiness, The Dalai Lama, writes that “Planting trees is a virtuous act.” It is also hugely beneficial for humanity, offering food, shade and carbon sequestration. His Holiness, Kiss the Ground and H.R.H. The Prince of Wales are all pro-harmony with nature and trees, contributing their wisdom at EarthGratitude.org in the mini ebooks and the 14-Days of Gratitude and Sustainability virtual event. Did you know that LED bulbs use 15–25% of the energy of incandescent bulbs and can last 25X longer? Dine by LED candle light (or wax) and include this wisdom when you share your pics and videos with your friends. The added benefit is that you can save 85% on your lighting bill! When we flood our creative problem-solving mind with the endorphins of gratitude, we are open to receiving the spectacular solutions that are needed now to ensure that generations to come will enjoy this beautiful blue ball that we call home. That is why my partners and I advocate taking (and sharing) the Earth Gratitude challenge. What is the Earth Gratitude Challenge? On April 22nd, Earth Day, we’re encouraging everyone to power up the gratitude and power down the grid, getting as close to personal net zero as possible for at least one hour. Whether your celebration is an intimate, candlelit, plant-based dinner, a community or school garden planting spree, or an epic, unplugged drum circle under the stars, there are bound to be fresh insights gained from pushing pause on the daily routine and trying something new. Share your celebration using the hash tag #EarthGratitude, so that we can like and reshare. There is a lot of misinformation, particularly in the advertisements that prevail in the mainstream. Large corporations that are slow to embrace change, often advertise that they are green, while hiding and covering up the damage that they do, with the words “eco-friendly” and “clean” or “green.” Sometimes the truth is difficult to find. That is why I have spent the last fifteen years of my life traveling the globe to witness the research and information firsthand, to ensure that the contributors to the Earth Gratitude project are indeed walking the walk and have real data to back up their claims and results. We’re already experiencing some pretty devastating effects from climate change. The first climate change refugees in the U.S. are being evacuated off of an island in Louisiana. Florida is experiencing sunny day flooding. The truth is that we all need to get informed and shift our habits yesterday. The beautiful upside is that when we do, we not only save the planet, we also save thousands of dollars in our annual budget (through smarter energy choices). Start increasing your wisdom by participating in the 14 Days of Gratitude and Sustainability virtual event. Each day, you’ll receive valuable information and tips to start on your journey to a cleaner, greener and more empowered life! 11. Watch and Share the Earth Gratitude film. The 4-minute film features Alvin, Jada and Satori Tam, who made a brave move to an off-grid lifestyle, after being inspired by the indigenous people of the Sacred Valley in Peru. You have authorization to screen this film on your website as long as you use the following attribution: Film by BarefootSanctuary.com and EarthGratitude.org. I am here to help in any way that I can. Sustainability is my mission, vision and life journey. Feel free to tag me on Twitter or Facebook with any questions you might have, and someone on our team will be sure to offer resources and information, or track down the solution! Have an epic, delightful Earth Day (every day)! Whether you are interested in gardening, planting trees, reducing your own carbon foot print, saving endangered species or saving money, you will find easy, actionable strategies and important information from the world’s leading experts, who contribute to the Earth Gratitude project, at EarthGratitude.org. Seeds of Prosperity. Grow. Healthy. Guardians of the Environment. Volume 1.